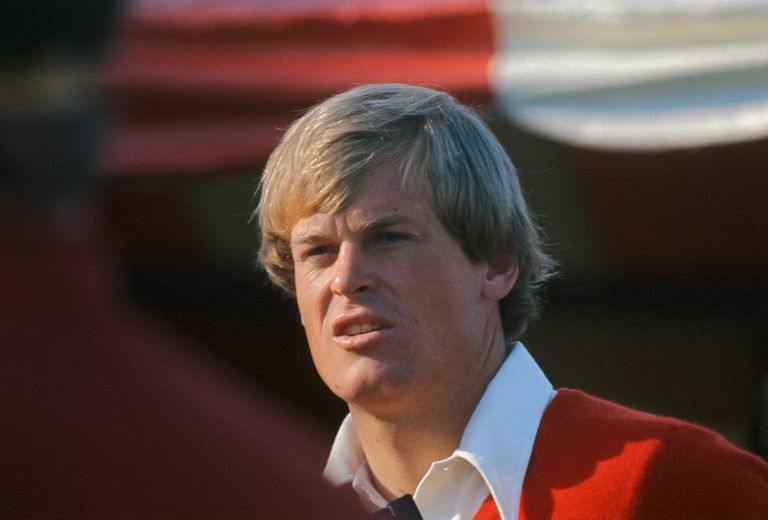 Johnny Miller played one of the great rounds in golf history in 1973 and won two majors in the mid-1970s. Beginning in the 1990s he became one of golf's best-known announcers. Nickname: During his playing days, Miller was sometimes called "The Desert Fox" because so many of his wins came on the desert courses of Arizona and Southern California. Johnny Miller: "I didn't value enough what it was to be a champion. I didn't buy into the majors as much as I should have." Johnny Miller: "Sometimes I think that when we get up in heaven, God's going to let everyone be 28, and there's going to be this great tournament." Lanny Wadkins: "Johnny was the best I ever saw at hitting pure golf shots." Lee Trevino on 1966 U.S. Open: "It was my first Open and I was running scared. But Johnny had some swagger, and he was already so good, it was like his forehead was stamped 'can't miss.' "
A golf urban legend holds that the golfer whose profile appears in the PGA Tour logo is Johnny Miller. This is not true. According to the PGA Tour, the logo is not based on any one player. Miller's PGA Tour money title in 1974 is the only one from 1971 to 1980 not won by Jack Nicklaus or Tom Watson. There are legions of golf fans who know Johnny Miller only as a television broadcaster. After retiring from the PGA Tour, Miller rarely played the Champions Tour, and his fame as a golfer faded. When he debuted on golf telecasts as an analyst, Miller was a breath of fresh air, unafraid to call it as he saw it. Miller even had the gumption to toss around the word "choke" and apply it to specific players. Many golf fans and professional golfers came to love Miller's broadcasting; but many also came to dislike it, believing Miller too blunt. Miller grew up in San Francisco and won the 1964 U.S. Junior Amateur Championship, then had a successful college career at Brigham Young University. As a 19-year-old amateur, Miller finished eighth at the 1966 U.S. Open. He turned pro in 1969. He'd won twice on the PGA Tour when, at the 1973 U.S. Open, he produced one of the best rounds of golf ever played. Miller's final-round 63 led him to the first of his two major championships. Coming on the brutal Oakmont Country Club layout, and in the final round, and producing a victory, that round is ranked by many the greatest in the history of golf. Miller also won the 1976 British Open.